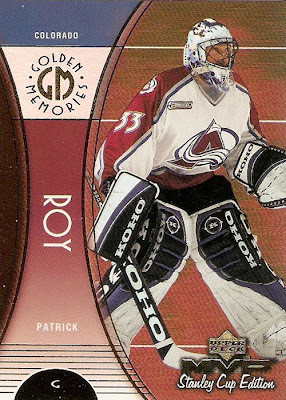 This post strays a bit from the usual focus on hockey cards, but that's not necessarily a bad thing. I was lucky enough to get free tickets from work to two Wings games, Thursday 10/21 versus the Flames and Thursday 10/28 versus the Coyotes. Looking at these two tickets got me thinking about ticket designs and how they relate to card designs. I've seen some good looking ticket designs and I've seen some pretty bad ones. This year, the Wings are going with the No Limits theme. I really like the incorporation of the highway sign as well as the Michigan and Windsor maps as backgrounds. I've seen some people like to collect ticket stubs, I kind of collect them just by holding on to all of them. Do you save your game tickets? Do you collect tickets from games you weren't at? Have any cool looking ticket designs? Any bad ones? 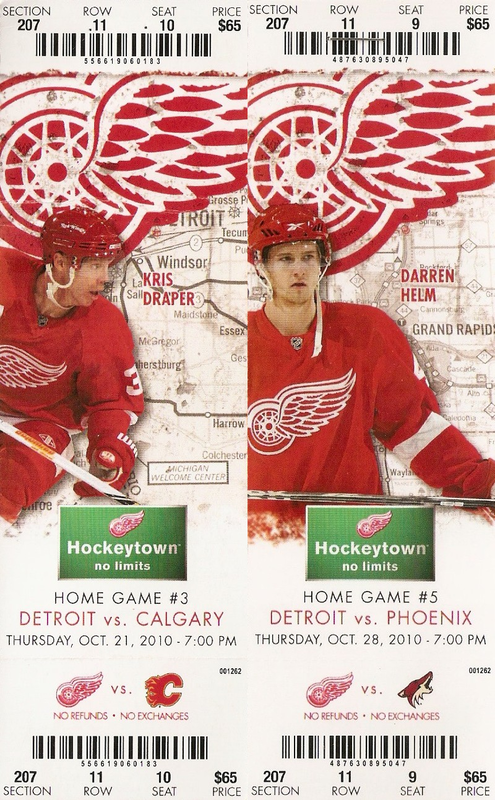 I've only been to Red Wings games so I'm curious to see what's out there as far as other teams and their ticket designs. In case anyone was wondering what the view from section 207, row 11 at the Joe looks like, here are a couple pictures from the Coyotes game: one from before warm ups and another during the 2nd period. As I've been attempting to better organize my binders lately, I've come across quite a few more cards I thought were interesting for one reason another. This Rod Brind'Amour base card from 2001-02 Topps is one of the ones I'm referring to. 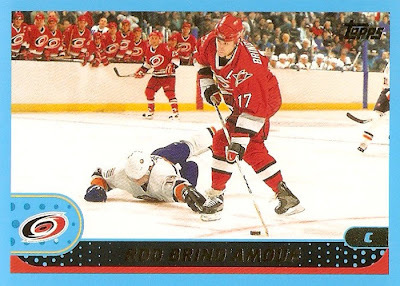 This is just an awesome action shot, taken right in the middle of a near breakaway opportunity for Brind'Amour. It's just that much better than you can see the entire Canes bench on their feet in the background, while all of the Islanders remain seated on their bench. As far as the actual design of the cards, its not too bad overall. When I first saw this set back when it came out, the blue border was definitely different to say the least, but when you look at it in relation to the rest of the card, it isn't so bad. The dots are a bit odd looking, but somehow they just work with the blue and the gold foil. One interesting thing with this and a few other sets I've seen is the lack of advertising on the boards. Most images on cards have it, but this one does not. I don't know if that is because Topps didn't want to provide 'free' advertising or if they just thought the cards looked better without the adds. Anyone have any ideas on this one? 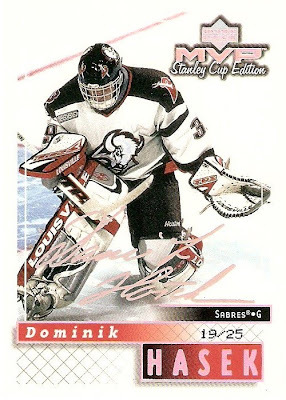 After looking through some of my binders for cards to help complete my MVP Stanley Cup Edition master set project, I decided to begin, or should I say continue, a second player collection in former Red Wings and Sabres goaltender Dominik Hasek. Hasek was always my favorite player growing up, despite him playing for the Sabres while I was a Red Wings fan. I used to casually pick up lower end cards of his just because he was my favorite player. 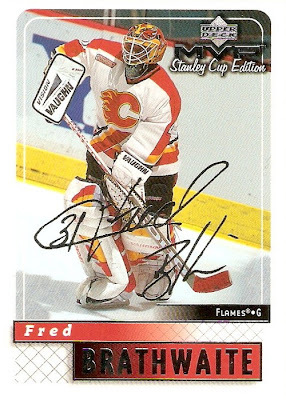 After finding nearly 60 or so base and insert cards between the Sabres, Senators, and Red Wings, I knew I wanted to continue collecting more Hasek cards. I still remember the day the Wings traded for Hasek. 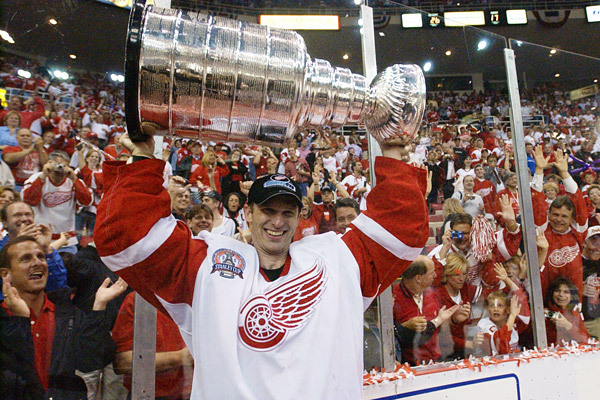 I didn't believe it at first, my favorite player and one of the best goalies in the world was coming to Hockeytown, a definite win win situation for me as Wings fan. He helped bring us the cup that year and that pretty much solidified him as my absolute favorite player. 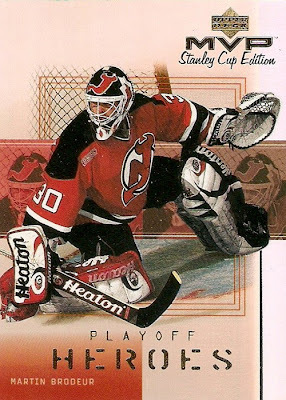 Doing this gives me something to look for that my Jimmy Howard collection does not, and that would be base and insert cards from the good old days of the 90's, when there were all kinds of sweet looking base and insert sets, unlike right now. As far as the cards I already have. 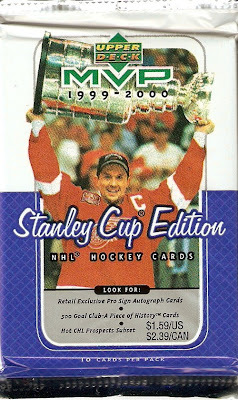 My MVP SC Edition Super Script would have to be the centerpiece of the Hasek collection so far. Other than that, I have one jersey card and that's it, meaning there's probably hundreds, if not thousands of Hasek cards for me to go after. 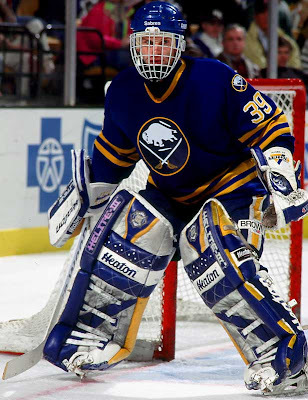 The more I think about it, the more I like the idea of collecting both Hasek and Howard now. It's a great then and now kind of pairing. I know some collectors stick to one guy forever and others collect twenty different guys. What are your thoughts on the perfect number of player collections? It's been almost a month since I've done one of these, so here we go. 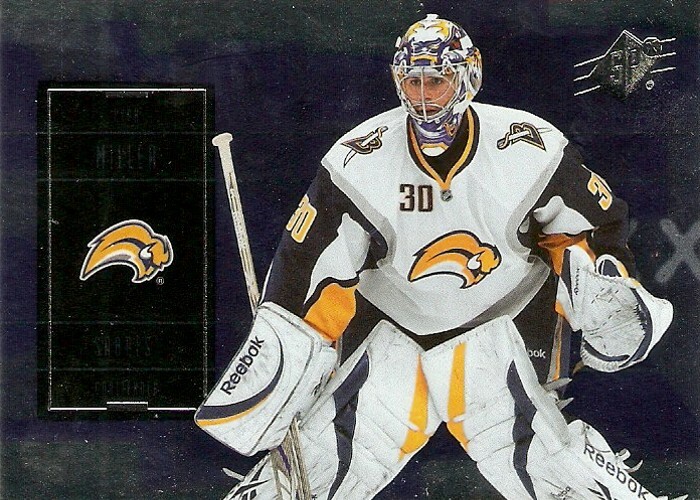 This pick is a pretty sweet looking goalie-themed insert from 2001-02 Pacific. 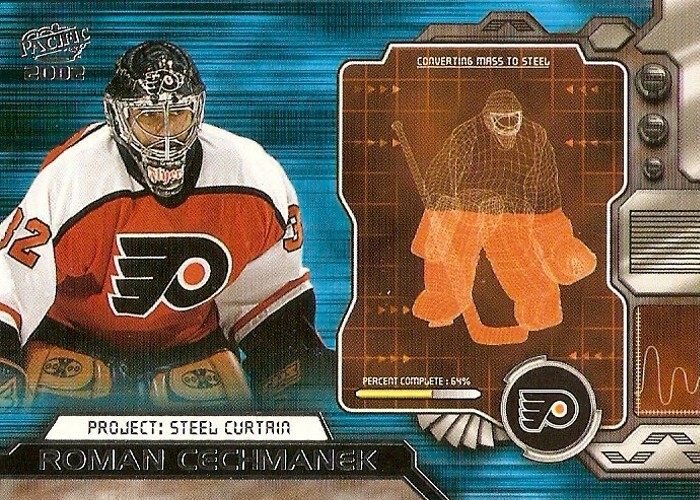 It's a Roman Chechmanek Project: Steel Curtain. I love the blue background on these cards, especially on this one as it makes for a great combination with the Flyer orange. There are some great combinations of patterns and other elements that set this set apart from other goalie-themed insert sets. The entire right side of the card is just downright cool, although some may not agree. I like it and it's something not really seen before. I like the use of the team color for the background and fill effect as it fits well with the nicely placed team logo in the black circle. Another cool thing is I believe they took the full color image on the left side and used it as the outline for the wire-frame style image on the right side, rather than just some generic goalie pose. 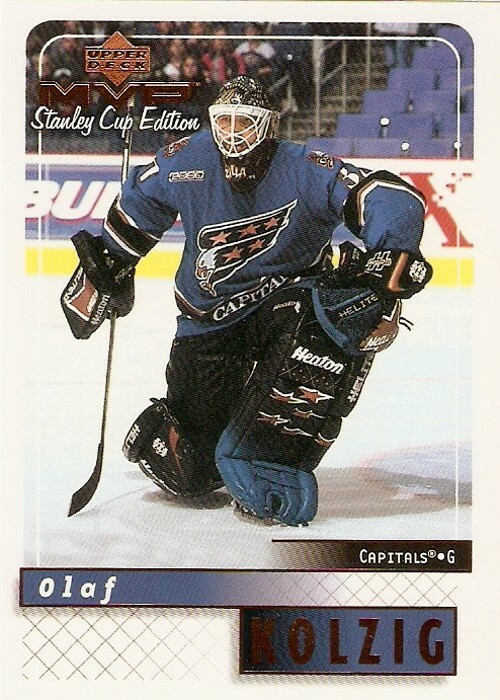 I'd have to find another card from this set to confirm that though. I think the only thing I could do without would have to be the little sets of arrows pointing inward on the right side. I think just the grid pattern behind the semi-filled wire-frame would have sufficed. It's cool sets like these that make me miss the days when Pacific was still the licensed hockey card market. They definitely had some great looking designs back in the day and this was just one of them. Between my last box break and all of the inserts I already have from previous pack and box breaks, I want to pursue the rest of the inserts and go for a legitimate master set. I believe I have a decent start to most of the insert sets like Cup Contenders and Stanley Cup Talent. The others however, like ProSign and Game Used Souvenirs, not so much. Now that I've decided to go for a legitimate master set, I thought I would lump all of the various inserts, besides all of the script parallels, into a single label on the blog. Altogether, if my math is correct, that brings the total to 1021 cards for the complete master set. 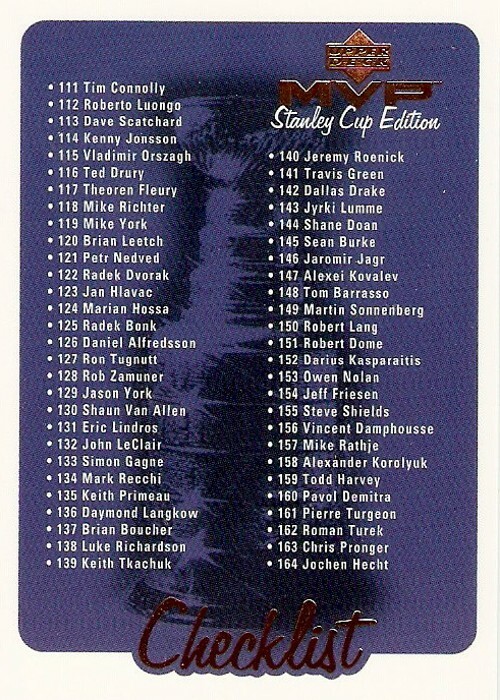 If you know of any inserts from this set that I've missed with this list, let me know as I would like the list to be as accurate as possible. I was at my LCS the other day picking up some supplies and thought a good way to use up the rest of the money I brought with me was on a pack of something I've yet to buy this year, that being SPx. I've seen plenty of breaks on the various forums and thought what the heck, I might as well grab one pack and see what happens. I didn't expect to get much and that's exactly what happened, all base cards. Not all that bad for nothing but base cards. I really like the Datsyuk with the winter classic jersey. 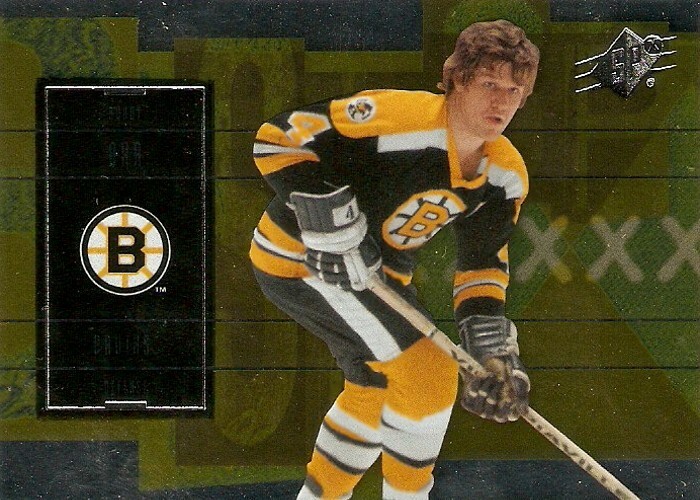 The Orr is cool too, it's always nice to see some older players thrown into a newer base set. Overall I like the design, especially the fact that all of the cards are horizontal. They're just really, really shiny as you can see from the scans. The only thing I don't get is the few random x's in the middle on the right side. One thing this set lacks that I miss from older SPx releases is the hologram image on the front of the card. 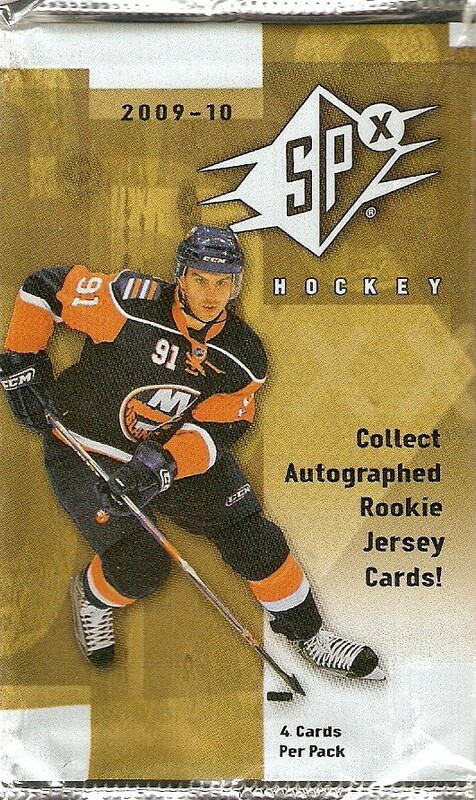 Those kind of set SPx apart from other sets in the past, but oh well, these are pretty nice too. 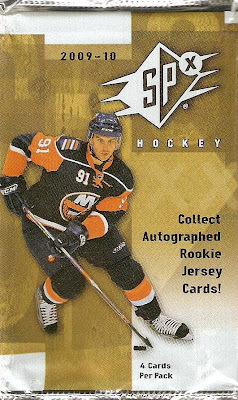 Now that I've completed the 99-00 MVP SCE base set nearly two times over, I've come up with something to do with all of the duplicates I've got laying around. I've decided to call this project Ink Script. The name is derived from the Silver/Gold/Super Script project. 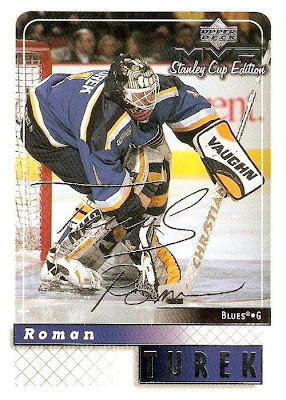 The idea actually came from one of my previous TTM successes, Patrik Stefan, which just happened to be one of the base cards from this set. 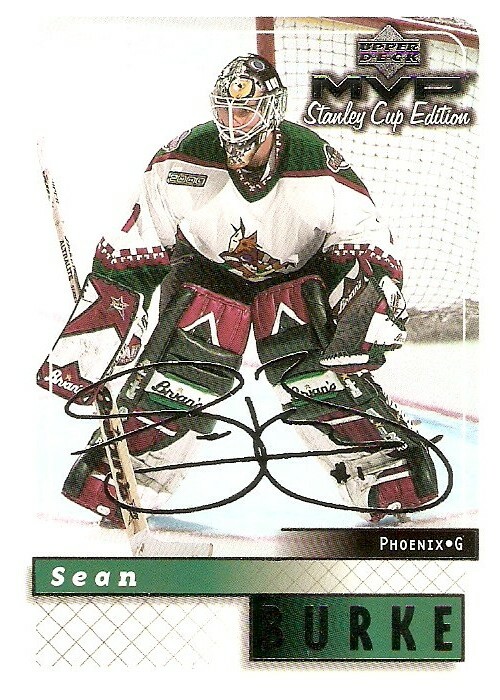 The goal of this project would be to acquire a hard-signed copy of every base card, primarily through the mail. 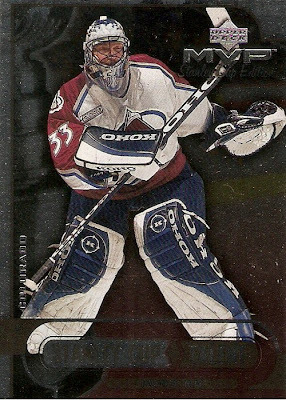 To the best of my knowledge, I believe the only autograph I cannot pursue would be former Montreal Canadien Sergei Zholtok, who tragically died of heart failure while playing for HK Riga 2000 of the Belarusian Extraleague during the 2004-05 NHL lockout. That said, I would need to come up with 216 autographs, as there are two checklists at the end of the set I won't need signed. It sounds like a lot to take on, but it's another long term project so it should be interesting nonetheless. The only downside to it would be the cost of postage and envelopes for over 200 TTM requests. 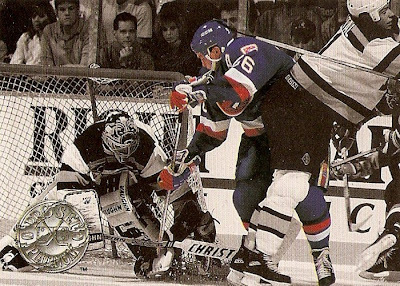 I've actually already got one request on it's way to Jeff Friesen, who was a member of the Sharks during the 1999-00 season. I have a few other duplicates on standby too, those should be on their way shortly. As I mentioned earlier, I added quite a few Silver Scripts from my last box break. I ended up with exactly 18 of them, but I already had three, so make that 15 new ones to cross off of the list. The rest of them included: Nedved, Tverdovsky, Sillinger, Whitney, Lukowich, Gomez, Recchi, Woolley, Sheppard, Satan, McAmmond, Lundmark, Brendl. 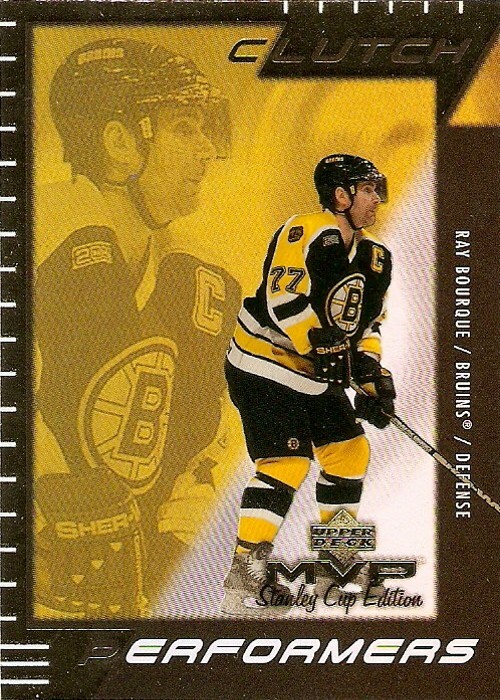 The doubles are of Nedved, Tverdovsky and McAmmond so if anyone is interested in any of those three let me know as I have no use for duplicates in any of the parallel sets. The 15 new additions bring the Silver Script total to 33, which is exactly 15% of the entire set. This means the entire parallel and base set project is now at 275/880 or 31.25%. This would be the other birthday gift box I was referring to earlier. Since I've started going after the Super, Gold, and Silver Script parallels from this set, I've wanted to bust a box of it. I got this one for myself for $45 delivered from ebay, including $15 for shipping. Not too bad considering these boxes are pretty much impossible to track down at the local card shows around here. I love the wrappers from this box. Being a Wings fan, it's nice to see they chose Yzerman to be the player featured. Too bad they didn't use a shot from the 1997 championship, but this one works. The one thing I really wanted to accomplish with this box was a complete base set and I got just that, and then some with over 100 duplicates. That's not necessarily bad though, as I've got plans for these duplicates with an upcoming project idea. I don't know what it is about this base design, but it's one of my absolute favorites. I like the white borders and the netting effect on the bottom. The bronze foil adds a nice touch and I really like the addition of the Stanley Cup Edition text under the MVP logo. There was also this subset of cards featuring prospects from the CHL, including the likes of Pavel Brendl, Milan Kraft and the Sedin brothers on the only two SHL cards in the subset. 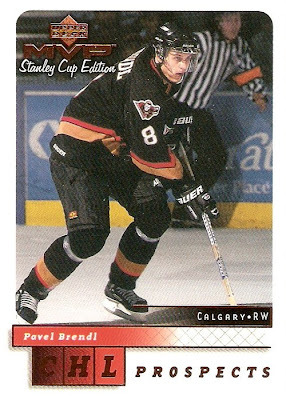 Same design as the base set, with the exception being CHL prospects in place of the players last name in bronze foil at the bottom. These cards are always forgotten and I thought I would show one of them off for a change. The blue background featuring Lord Stanley's Cup looks great with the bronze foil and white text. This insert set had a great selection of stars including Bure, Fedorov, Jagr and others. I like the silver foil border and MVP logo in the corner. 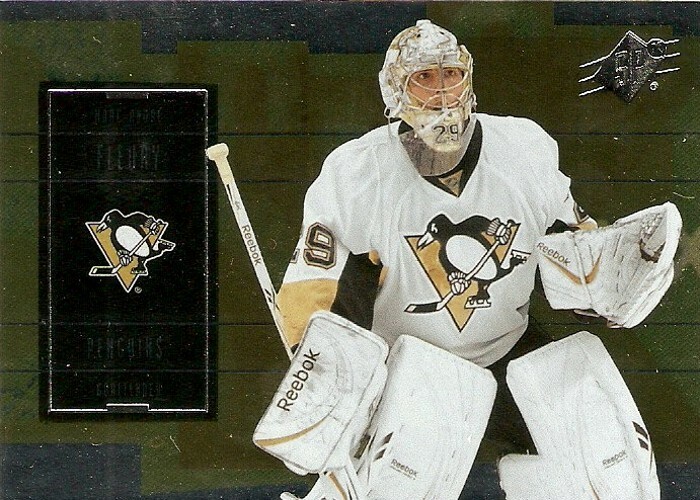 I also like the half image of the Stanley Cup and the fading to team colors towards the bottom of the cards. These cards make use of team colors and a lot of silver foil in the background and text elements. 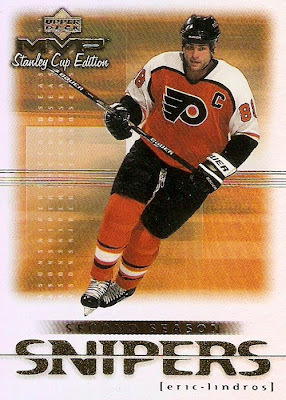 I question some of the player choices as "Cup Contenders" though, like Patrik Stefan and David Legwand. These cards focus on past playoff highlights. At least they changed it up a little with these and threw in some gold foil for a change. They also have a pretty weird looking font on the player's last name and for the "Golden Memories" circular text. These ones are a bit different from the rest and they're actually pretty nice looking in my mind. I like the use of the double image and the combination of gold foil and black for the border. Not sure about the white tick marks on the edges though. Like the Clutch Performers, these are printed on a rainbow foil card stock and actually look pretty good. The background is a little random, but "snipers" text is just downright cool looking. These are also printed on the rainbow foil card stock and also look pretty good overall. 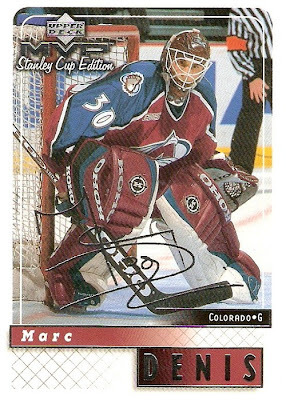 I like how part of the main image is repeated across the center of the card and the fading to team colors in the lower left hand corner. The font on "heroes" is pretty cool too. There are a few other inserts I didn't pull from this particular box including the ProSign autos and the game used souvenir cards, which actually had pieces of game used puck and that's something I wish there was more of now as I think it's different and a really cool idea. All in all, this was a very enjoyable break. I got some more cards for my Silver Script set, which I will discuss in a later post, and I got the completed base set I was looking for. It's been a while since my last garage sale pickup. This one is not as impressive, but still pretty sweet. It was a Donruss Preferred tin filled with a stack of mixed cards from the 80's, 90's, and 00's, for only $2. I've gotten a few of these tins in the past and they're pretty cool. They're also a good way to store a handful of top loaders. This is the second Roy/Brodeur tin I've added to my collection. This Vladimir Ruzicka is from 1992 Pro Set Platinum. I really like the simpleness of this set, it's kind of different that there is no mention of a player name on the front of the card. 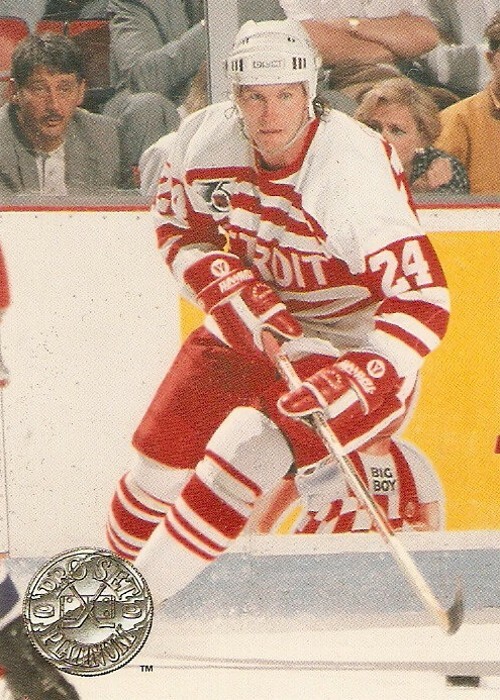 This Bob Probert is from the same set and it shows him wearing the only third jersey the Wings have ever had. Other than that it's a great action shot, which is the case with most of this set. Fnally, this Patrick Flately is again from the same set. I like this one the most because it not only has a great action shot of a wrap around attempt, but becuase they isolate Flately in color while the rest of the photo is presented in black and white. 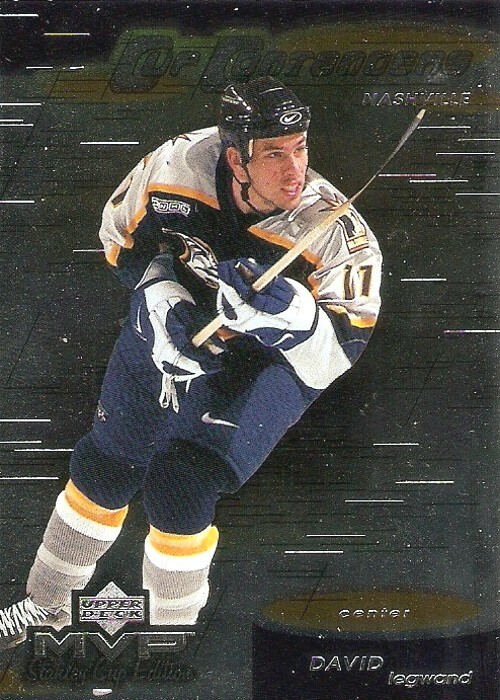 There were about 20 more of these Pro Set Platinum cards and a bunch of Parkhurst cards. Not bad for only $2. Garage sales aren't the first place I'd look for cards, but you never know what you'll find, so don't count them out when it comes to finding hockey cards. 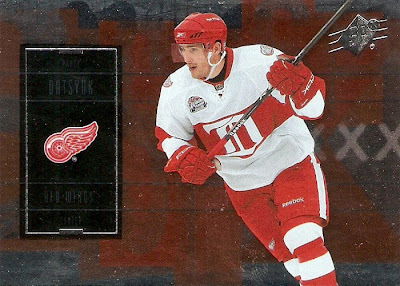 I came across another one of my many Red Wings cards worthy of a captured on Cardboard post. This time, it's a Mike Vernon from 1997-98 Upper Deck. 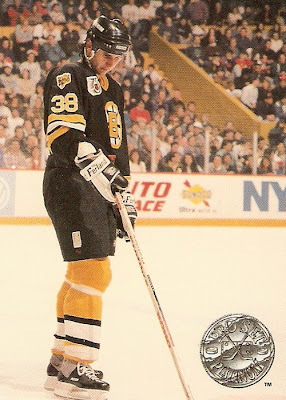 This set of game dated cards is probably going to be making a few appearances as it captured some of the better moments from the 1996-97 season, like this one with Vernon and the Conn Smythe. Again, this moment is captured both on cardboard and on video. The YouTube clip is the first part of the Cup presentation after game four of the 1997 Stanley Cup Final at Joe Louis Arena in Detroit. The photo on the card was taken around the 9:44 mark of the video. 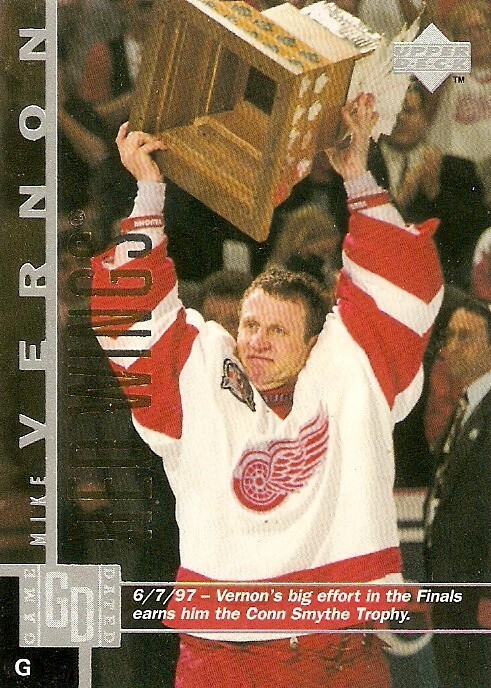 It was definitely great to be a young Wings fan just getting into hockey when the Wings brought home the Cup for the first time in 42 years that night. The second Stevie Y hoisted the Cup above his head at center ice is still to this day my favorite Red Wings moment.